New York Concert Cast, 1985 (RCA, 2CDs) (4 / 5) This concert production at Lincoln Center featured an all-star cast, and the results were dazzling if not perfect. 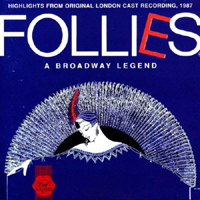 All of the show’s strengths are clear in this nearly complete recording of the Follies score, but there are so many opportunities for big moments by stellar performers that it takes some doing to keep everything in balance. In fact, the balance is decidedly off when Elaine Stritch makes “Broadway Baby” into a weird, disenchanted cousin to “The Ladies Who Lunch.” More in line with the overall concept is a sweet memento from Betty Comden and Adolph Green, who chirp “Rain on the Roof, ” and a grand memento of operatic glories past is diva Licia Albanese in “One More Kiss.”(She’s beautifully paired with the clear-voiced Erie Mills.) Phyllis Newman as Stella is no match for Mary McCarty, nor does Carol Burnett, good as she is, offer a more definitive “I’m Still Here” than Yvonne De Carlo’s original. But Barbara Cook is up to the Dorothy Collins standard; not surprisingly, “Losing My Mind” is one of the highlights of the disc. Lee Remick is engaging as Phyllis, and George Hearn does well as Ben. In the role of Buddy, Mandy Patinkin offers his strange combination of fine singing and irritating self-indulgence. Everyone else delivers the goods acceptably, and the orchestra is no less than the New York Philharmonic, conducted splendidly by Paul Gemignani. — R.B. Original London Cast, 1987 (First Night, 2CDs) (4 / 5) Sondheim made considerable alterations to the score for this production. The Prelude and “Bolero d’Amour” were cut, “The Story of Lucy and Jessie” was replaced by an “intellectual striptease” called “Ah, But Underneath,” “The Road You Didn’t Take” was dropped in favor of the intricate Ben/Phyllis duet “Country House,” there was an entirely different “Loveland,” and Ben’s “Live, Laugh, Love” became his exhortation to “Make the Most of Your Music.” As for the leading performers: Diana Rigg is a predictably strong Phyllis, Julia McKenzie is a moving Sally, David Healy does fine as Buddy, and Daniel Massey is solid as Ben. 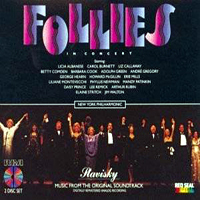 Some of the featured roles are cast with the resonance necessary to any production of Follies; Dolores Gray sings ”I’m Still Here” with much of her plush vocal tone intact, and operetta veteran Adele Leigh quavers her way poignantly through “One More Kiss.” A few of the others struggle too hard to sound American, and the show as a whole seems a little reserved and earthbound. British reticence? Perhaps. At any rate, an ideal Follies may reside only in the minds of those who adore the show. — R.B. 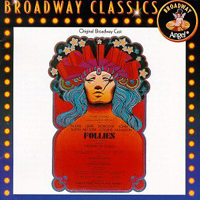 Paper Mill Playhouse Cast, 1998 (TVT, 2CDs) (4 / 5) As production costs skyrocketed in the 1990s, a full-scale Broadway revival of Follies seemed an ever decreasing possibility. But the Paper Mill Playhouse, a 45-minutes-from-Broadway theater in Millburn, N.J., mounted a well-received production in 1998. Some of the show’s scenic and sartorial values might have been stinted, but the casting was rich, imaginative, and crammed with Broadway/Hollywood talent: Kaye Ballard, Eddie Bracken, Laurence Guittard, Dee Hoty, Donna McKechnie, Ann Miller, Lilane Montevecchi, Phyllis Newman, Tony Roberts, and Donald Saddler. Some aspects of this revival were certainly arresting. Who, after all, was more qualified to sing “I’m Still Here” than Ann Miller, well into her seventies but still going strong? Who was a more apt “Broadway Baby” than Kaye Ballard? Who could be a more winsome Sally than A Chorus Line sweetheart Donna McKechnie? 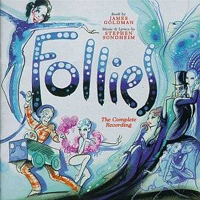 If not all of this two-CD set lives up to the highlights offered by those performers, it’s good enough to use an example of the ongoing truth that every recording of Follies is fascinating and absolutely necessary in its own way. One caveat about this one: It’s labeled “The Complete Recording,” and an appendix section does offer a wonderful array of songs written for but not included in the original production (plus “The Story of Lucy and Jessie,” which was dropped for the Paper Mill production in favor of “Ah, But Underneath”). But since most of the numbers created for the London version are not here, it isn’t truly complete. Still, why carp? The cast ranges from competent to magnificent, the atmosphere is theatrically solid, and the resonant acoustic is gracious to some of the older singers. — R.B.